If you fish silver fish matches on commercial waters unwanted carp are a big problem. Garbolino’s UK boss Darren Cox knows how to pull a ‘fast one’ over carp to bag up instead of being bust up. ONE of the problems with fishing winter silver fish leagues on carp infested waters is that you must avoid carp at all costs. Feed too much and you are likely to cause all sorts of problems if the carp are hungry; feed too little and you may miss out on the bonus skimmers, bream and tench that so often make the difference in these matches. Today I’m at Castle Ashby Lakes near Northampton, a fishery that I have become very familiar with over the last four years. It has also become one of my favourite winter venues and it is where my team, MAP Garbolino Starlets, is based for the Winter League campaign. Carp are barred for most of the winter matches and the venue is absolutely solid with roach and skimmers. 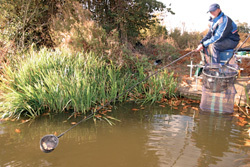 To do a team job you usually have to concentrate on these on the squatt and pinkie, but if you play your cards right you can often give yourself a chance of tempting a big skimmer that may put you in the frame. The idea today is to try and give an insight into how I tackle the problem of catching bonus fish among the carp but without waking them up. As the relatively new commercial fishery phenomenon develops, we are learning a lot more about the winter habits of carp. Ten years ago it was almost unthinkable to target them in winter but it appears that as these fisheries develop, so too do the carp’s winter-feeding habits. There have also been strains of carp such as the F1 hybrids that have been developed so that they feed in winter. Warmer winters will also help but I believe that the more the fisheries get fished in winter the more interested the carp become in feeding. These silver fish leagues, run throughout the country, are helping to develop feeding techniques that try to avoid carp. One of the problems with targeting the Ashby skimmers is that they have similar tastes to the carp. Another problem is that they tend to tag on to the huge shoals of carp in the winter. For this reason, you really need to be careful what you feed, where you feed and how much you put in. 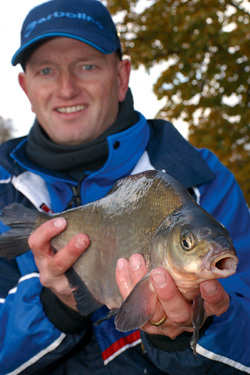 Bream and skimmers are more active at seeking out food than carp in the winter. When they are having a ‘peck’, the Ashby skimmers love pellets above most other baits. My approach is to feed very small amounts of pellets, sometimes only eight or nine at a time, with the same amount of caster and a tiny pinch of chopped worm. Chopped worm should act as the stimulant for fish to feed and the pellet and caster should help keep the skimmers in position long enough to hook them. One of the big differences between the way bream and skimmers feed compared to carp during the winter is that bream/skimmers appear to be more active in seeking out food. If you drop a bait on a carp’s nose in winter, there is a chance that he will eat it but will not always actively seek out food as bream do in cold water. For this reason, I believe that a tight feeding pattern is very effective. It works best of all when you are targeting random fish and don’t have a full five hours to catch them. You need to guarantee your team points, targeting smaller squatt fish for a good proportion of the match. There is a counter argument for my theory because the waggler and feeder boys do very well at Castle Ashby – but they also have time on their side. By fishing the waggler for a full five hours or so and firing pellets in via a catapult, they can activate the skimmers to feed, but they then graze over a bigger area, potentially taking much longer to find the hook bait once they are feeding. As a team man I do not have the time to apply these methods unless I’ve drawn on a shedful – and my name is not Sean Ashby! – so my approach is to feed through a pot and fish the pole. This way you can concentrate a small amount of feed very accurately where you want it. It may take the skimmers longer to find the feed but at least you can drop your hook bait right on top of any feeding fish, thus eliminating the need to search a larger catapult-fed area with a waggler. By having a regular look in-between catching squatt fish you can then keep in touch with what is happening and, if it is only one or two fish that will make the difference, then you have a really good chance of hooking them this way. Believe me it only takes 15 minutes to win a match when the skimmers arrive en masse! The more positive waggler approach is a deadly method on days when the skimmers feed properly and the Castle Ashby regulars are very good at it. But on the colder, unreliable days I prefer my pole approach. 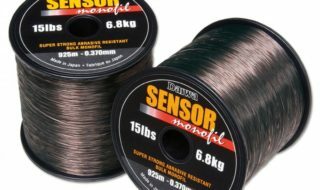 The bait requirement is not too demanding on the budget; often a handful of worms, half a pint of casters and half a pint of pellets will be more than enough. As for what pellets to use, then all you need are soft, soaked pellets. I use the Sensas Expandas in 4mm and 6mm for both the hook and feed. I do like to sweeten some pellets up for the hook with one of the Sensas Squirts – the Scopex & CSL is my favourite – or pure molasses is also really good. To prepare these sweeter pellets, then I simply immerse them in the liquid for 48 hours before the session and they will slowly expand taking in the additive. Once you have done one batch, if you keep them cool they will last half the winter. Casters and worms are also a good change bait for the hook, especially if you’re feeding them. Rigs are also pretty straightforward. The skimmers range between 6oz and 3lb, although I still tend to do my rigs to 0.12mm main line so that if I do encounter a carp I can only lose my hooklength. Normally you will either land the carp or the hook will pull out. A 0.10mm hooklength and size 16 or 18 Wide Gape Canal Seed barbless hook is a perfect combination I’ve found. The depth determines the float size and at Castle Ashby the average depth is just 3ft on the largest pools, Scotland and Grendon. For this reason I tend to use light floats, 4×10 or 4×12 are the norm, and I find that it often pays to cut the float stem and bristle down so that they sit better in the shallower water. If there is any tow then a small bulk of No10s set 10in from the hook and two tiny droppers works best because you can hold it back nicely. 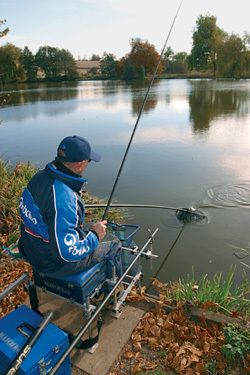 In such shallow water the tow plays a major part and you often need to determine whether the bait needs to be kept dead still or moved slowly with the tow. For this reason you will need several rigs set up, one with a finer bristle to see the delicate bites in good conditions and one with a thicker bristle to drag line on in the tow. 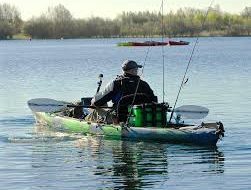 In good conditions it pays to fish as close to exact depth as possible and on windy days, with lots of tow, it is sometimes best to fish up to 1ft overdepth. Because of the depth, I use lighter elastics and find a light No6 prevents the fish from splashing on the surface but still gives a good hook hold on better fish. Skimmers are very fickle and spook very easily in clear, cold shallow water, so it pays to be very careful when playing every fish. A longer line also helps in this department. I tend to try and fish long for the skimmers if the weather allows because it does not interfere with my roach line. Normally, 13m to 16m is the best area but the skimmers do come in very close in milder weather and well-coloured water. Going back to the feed approach, if you find yourself on lots of skimmers then you can up the feed and I find it best to do this after every second fish. Two lines can often pay off on days like this. 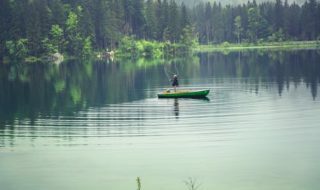 By alternating between the two – catch, refeed the swim then leave it alone and move to the other – you can keep the fish coming even in the clearest of water. The lines only need to be a few metres apart to be effective. Doctoring your floats is a great way to obtain the desired pattern from floats that don’t fit the bill. To lay line overdepth I require a thick-tipped float, so I’ve opted for a MAP 7 which has a carbon stem for stability and a thick, hollow plastic tip. Doctoring the float is actually very easy. Firstly, cut the float’s stem down. I use a set of tough cutters that give me a clean cut on the carbon that’s essential to prevent any line damage. Next, I remove the tip from the body. These floats have long, thick tips that are much too long for the depth of water I’m fishing, so they need cutting down. Again, I use a pair of cutters to trim a third off the top. Then, all you have to do is insert the tip back into the body, seal it with a dab of glue (just an optional extra) and there you have it – a perfectly-doctored float. It’s now the same length as the float I’d use on the lighter rig yet it will hold against any tow much better. Cut the float stem to the desired length. Darren’s cut his to 3in. Remove the tip from the float, making sure you don’t damage it. Cut the tip to length. About one third removed is fine. Insert the tip and add a drop of glue to secure it. Today, a –2oC frost after a relatively mild spell has been a real test. Clear skies, sunshine and high pressure are not good for most fishing, but determination and belief that what I was doing was right has brought me results. It took me two hours to catch a skimmer but by the end of the session I managed to snare five in total on pellet or caster, one of 3lb, two around 2lb and a couple of smaller models. The smaller 8oz to 12oz fish are often the signal that you are likely to pick up a few better skimmers. That’s the way to do it Darren! I have also put together 5lb of roach on worm and caster and have ended the four-hour session with around 13lb, which should be enough to frame or even win on most hard days. With a little thought and careful feeding, it is possible to catch bonus fish, in among and around carp, that will count in silver leagues and you can even use baits such as pellets, that are not supposed to work in winter! There are times however when the skimmers will not play ball or you may have drawn out of the area. This approach will not spoil your roach fishing and it will minimise the time spent looking for a bonus. One thing I will stress is never give up. Two bites in the last five minutes could equate to 5lb on waters like Castle Ashby and that will be your most likely time for a bite! 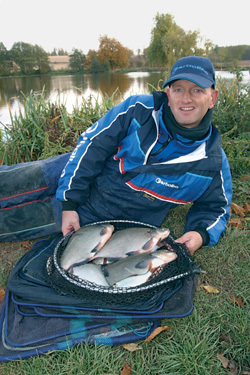 Give these ideas a go on your local silver fish venue and you may be surprised by the results. … Or How Not To Do It! Only a few days after we shot this feature I fished a round of our Winter League and completely defied my own theory. I did none of the careful, considered feeding, instead I fed pellets through a catapult rather than a pot. I had anglers both sides of me fishing for skimmers and I panicked early in the match as one of them caught two small skimmers in the first fifteen minutes. I was fortunate enough to still win the section with 4lb odd of roach, but didn’t catch a skimmer and was plagued with carp on my long pole line. If I had stuck to my own theories, I firmly believe that I would have caught an odd skimmer later in the match. Just six pounds framed and I gave myself an expensive lesson – not one to try in the future me thinks!